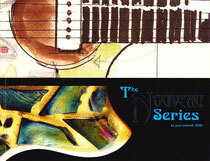 The Nouveau Series is a special project developed together with author and musician Paul Schmidt. 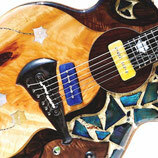 A series of guitars based on the Klein acoustic shape with inclusions of art nouveau artifacts. 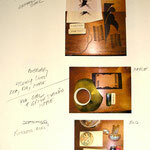 and upcoming exhibitions. 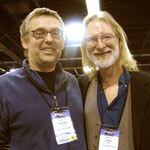 Please go to the Art Of Music website for more information. 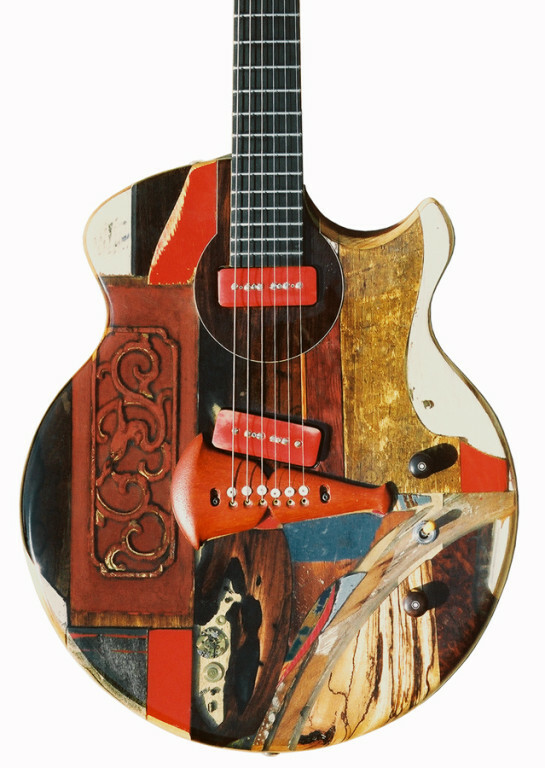 The complete 'Nouveau Series' was on exhibit at the Museum of making Music in Carlsbad, CA. 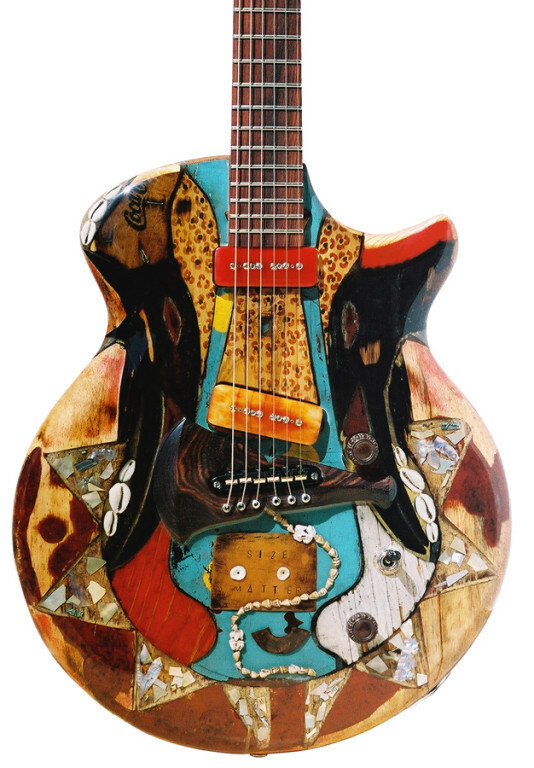 Author and musician Paul Schmidt commissioned this guitar after an exhibit at the Sonoma Museum of Art he co-curated with Steve Klein, called "Art That Sings", which included some of my guitars. 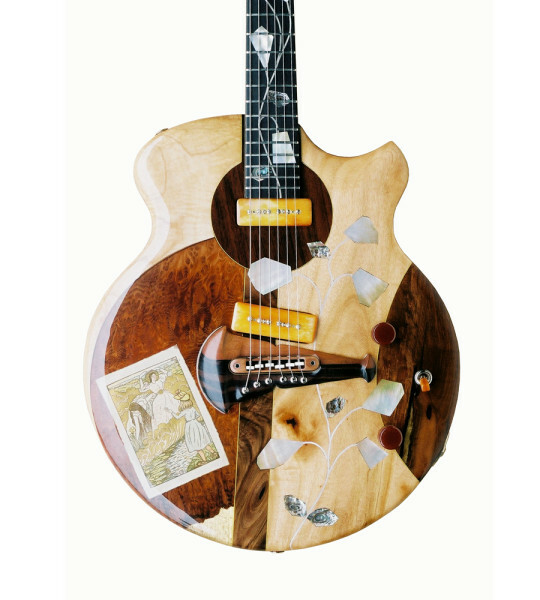 Paul wanted to base the design on a Klein acoustic shape, with an original Klein Rosewood neck and with bits and pieces from Klein's shop set into the top. 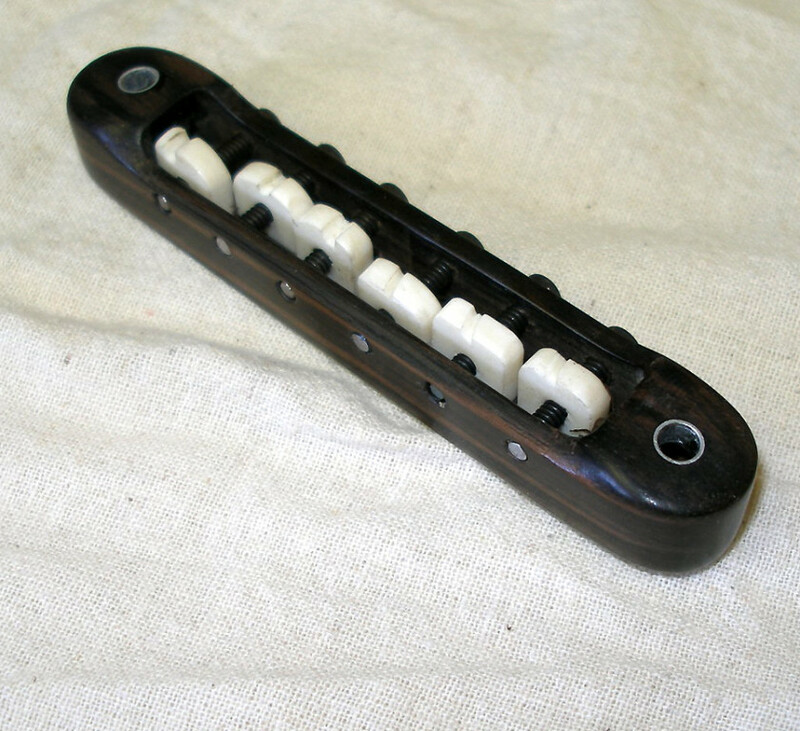 The pickups are Fralin Jazz Bars with oxidized brass covers. 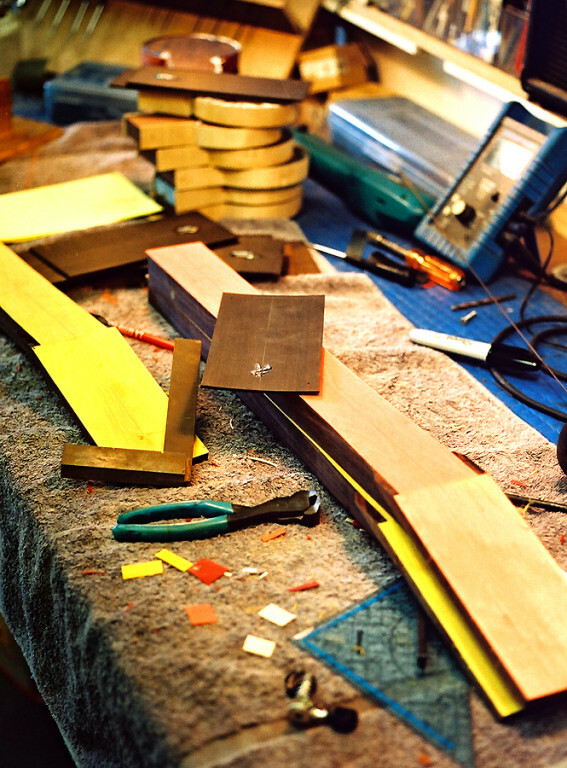 The body is flame Maple w/ a Cocobolo centerstripe. 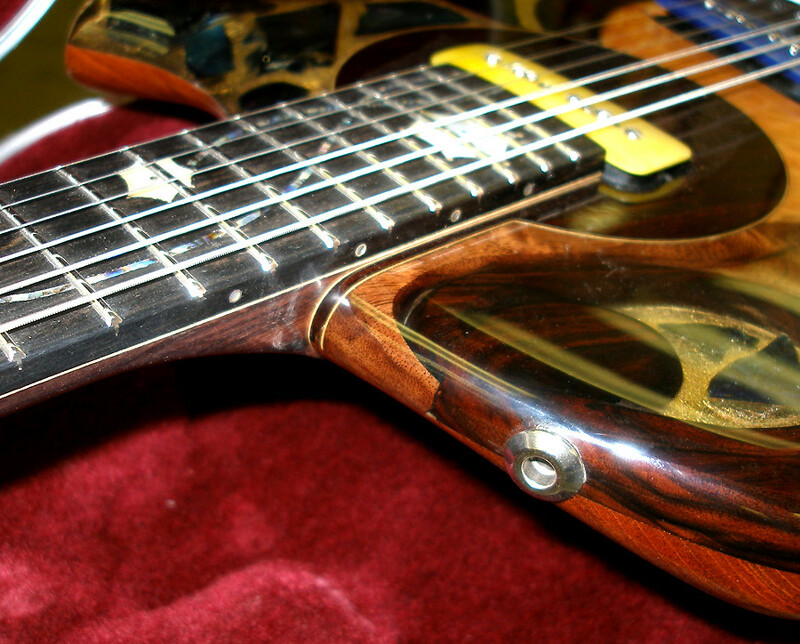 I fitted the neck to the body and installed Rodgers tuners. 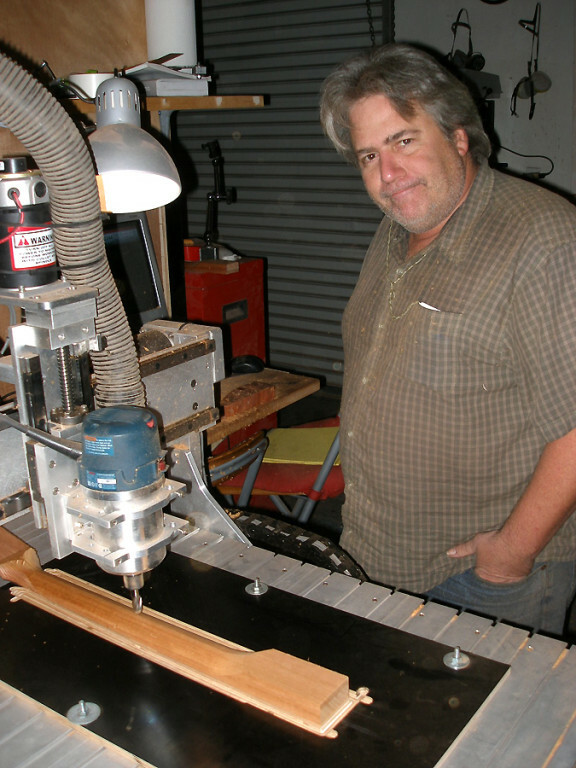 The bridge was fashioned from a modified Klein acoustic bridge. 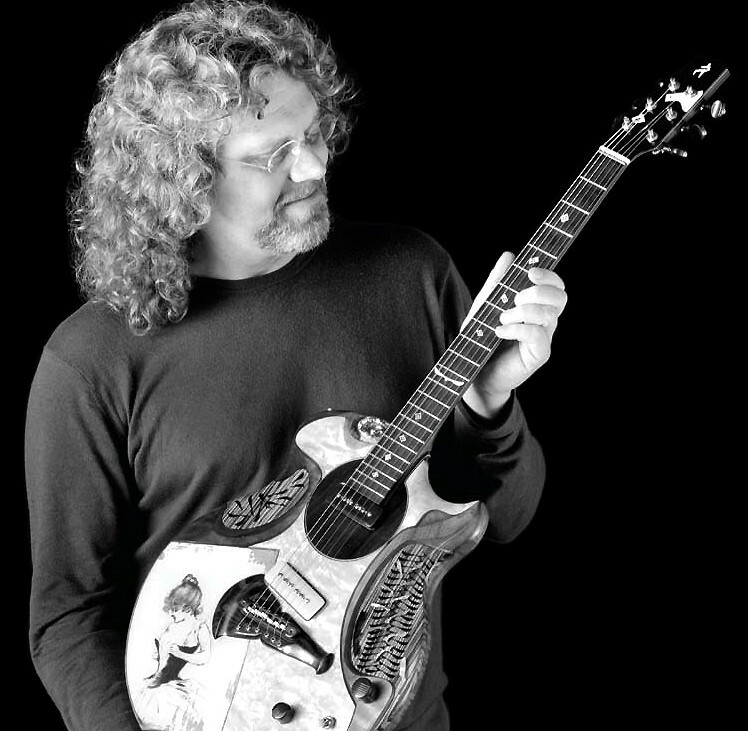 This guitar marked the genesis of the 'Nouveau Series' - even before it was completed Paul had the idea for a limited series of guitars constructed along the same lines, but incorporating nouveau art he had collected. 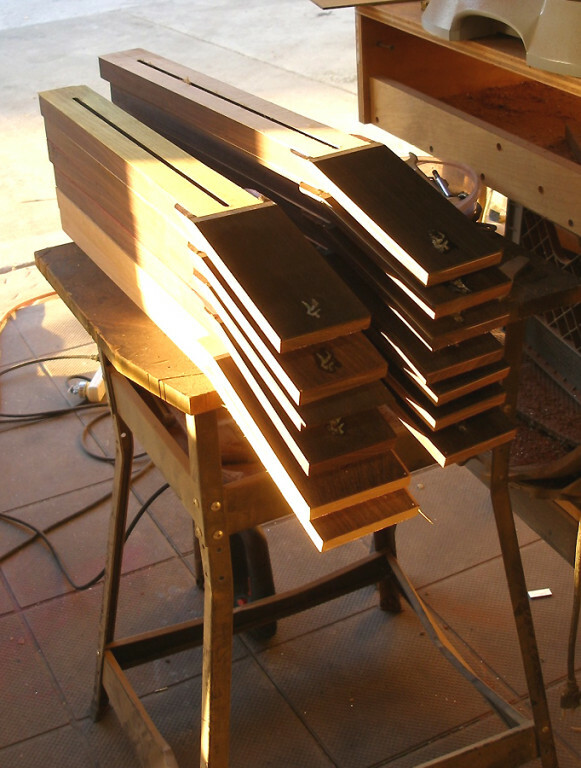 Originally we had planned to use some old Brazilian Rosewood neck blanks Paul had acquired from Klein for the Series. Unfortunately they proved to be unsuitable. 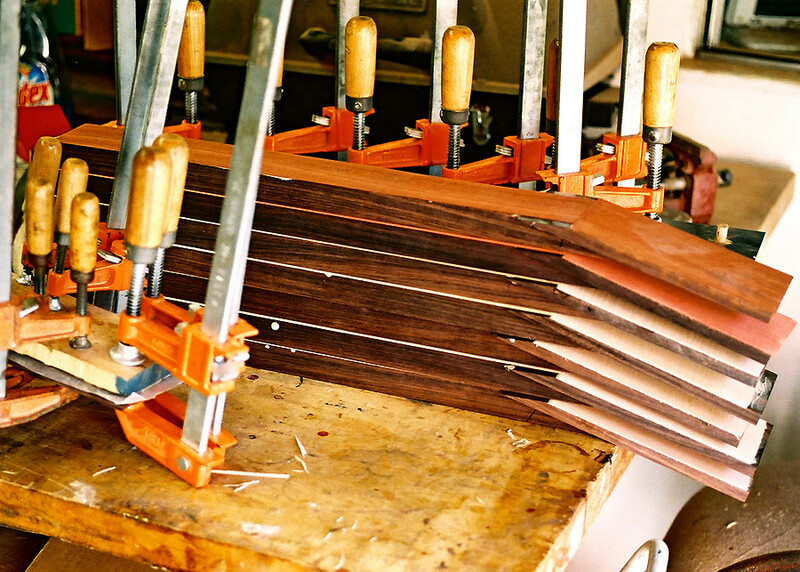 I eventually managed to find a sufficient stock of aged old-growth Indian Rosewood of comparable quality. 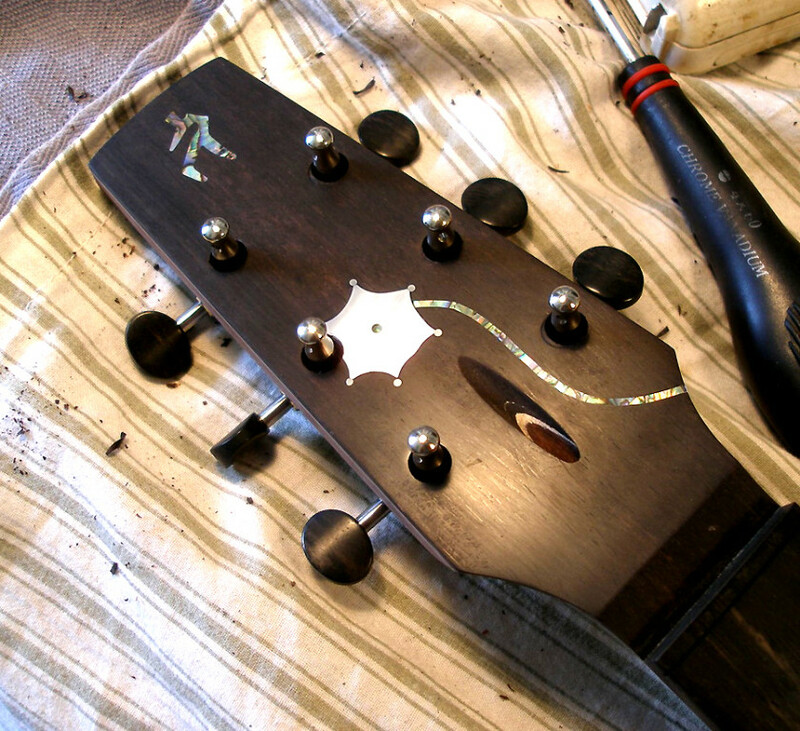 The Klein neck joint (as he had designed it for his acoustics) required some modifications for the purpose of the Series. I also wanted to experiment with various bridge designs, since I felt that an electric guitar should incorporate an adjustable bridge. 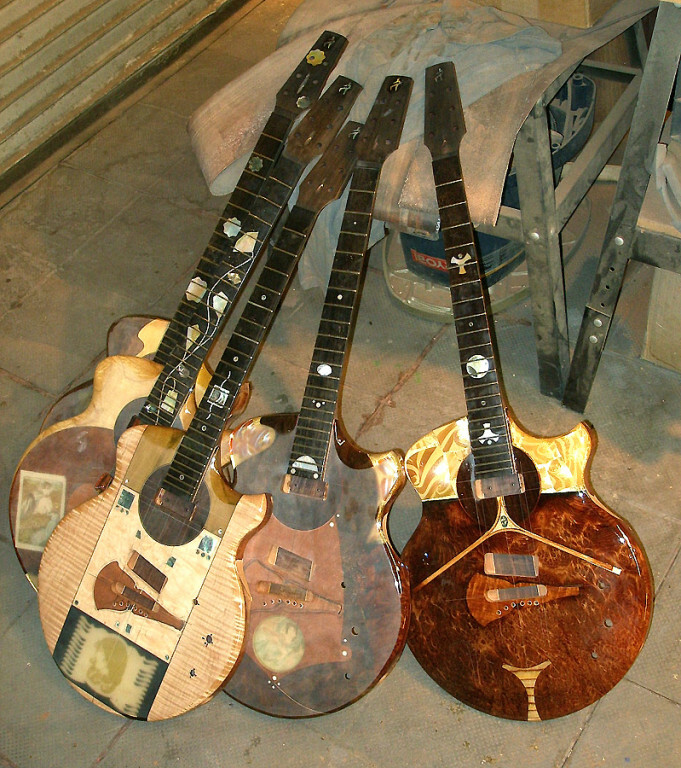 Along with the Indian Rosewood I had also acquired some aged Mahogany for the bodies, and I wanted to test the 'BoneTop' pickups I had developed for the Series in a guitar constructed with these woods. 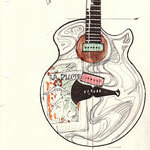 I made two experimental guitars, each using some of the features of the 'Series', with each focussing on a specific area and exploring various construction parameters. 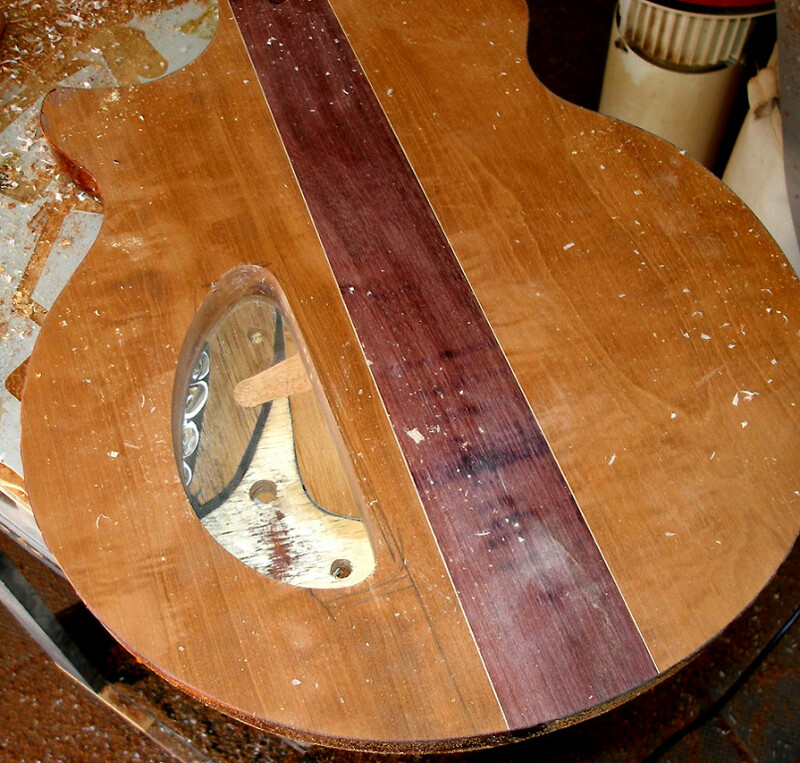 The neck-body joint was the first challenge - the original Klein neck of the ‘Downtown’ had required me to work with its specific configuration. Here the only constraint was that it would have to be bolt-on, since the resin process I use makes glued in necks impossible. 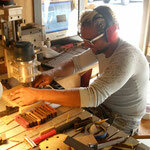 I finally settled on a type of long-tenon joint with a three-bolt attachment using machine bolts. 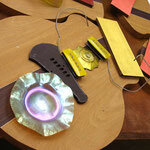 Only one is visible from outside, the others are set into the neck extension under the pickup - something which is structurally solid, tonally conductive and visually in keeping with the overall conception. An idea for an adjustable bridge however proved to be impractical. 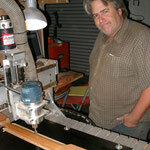 The second guitar was primarily a test-bed for a tune-a-matic style bridge solution and some other refinements. 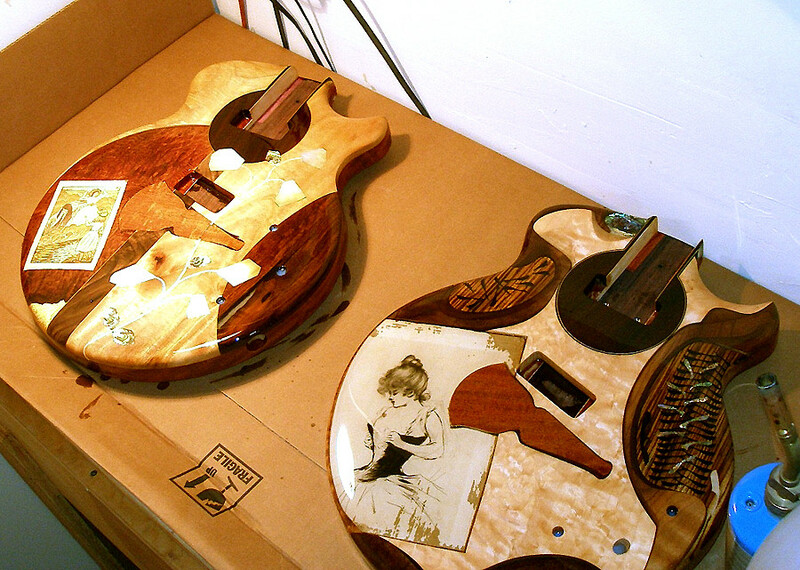 Both were fitted with the 'BoneTop' pickups. 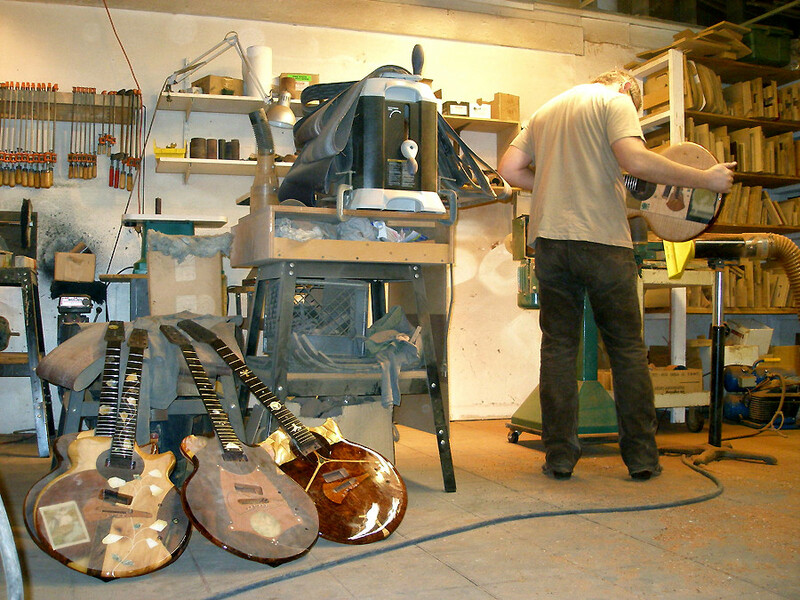 Armed with the experience these three guitars provided, I started to work on the one that was intended to be #1 of the 'Nouveau Series'. 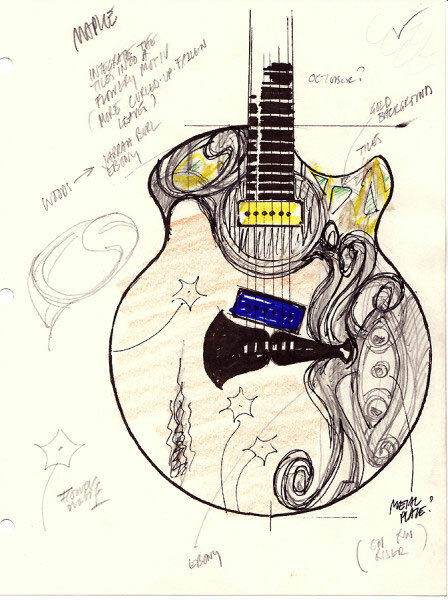 prototype - the "nouveau #0"
I had made some sketches using Nouveau-inspired flowing lines and decorations. 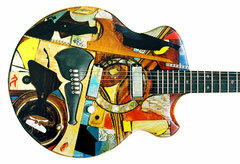 Each guitar was to be designed around the art it contained, incorporating and reflecting the aesthetics of the piece. 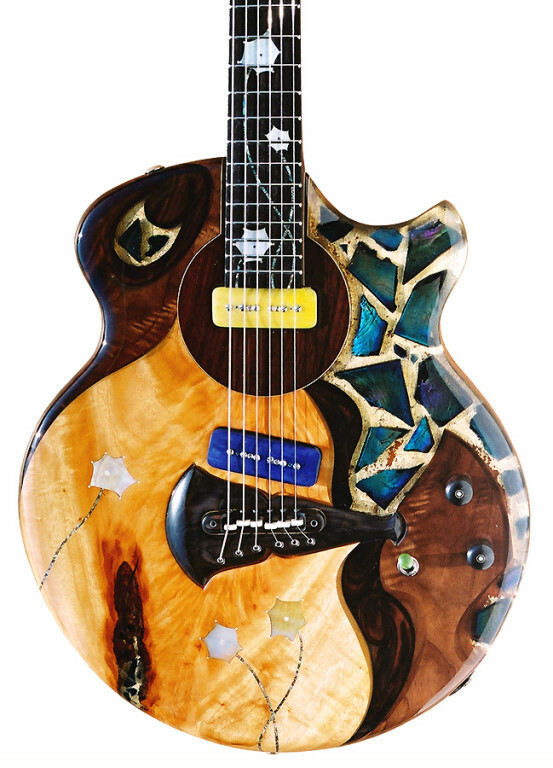 The iridescent shards of glass with their blue-green hue, which comprise the art for this guitar, were set against a gold leaf background. 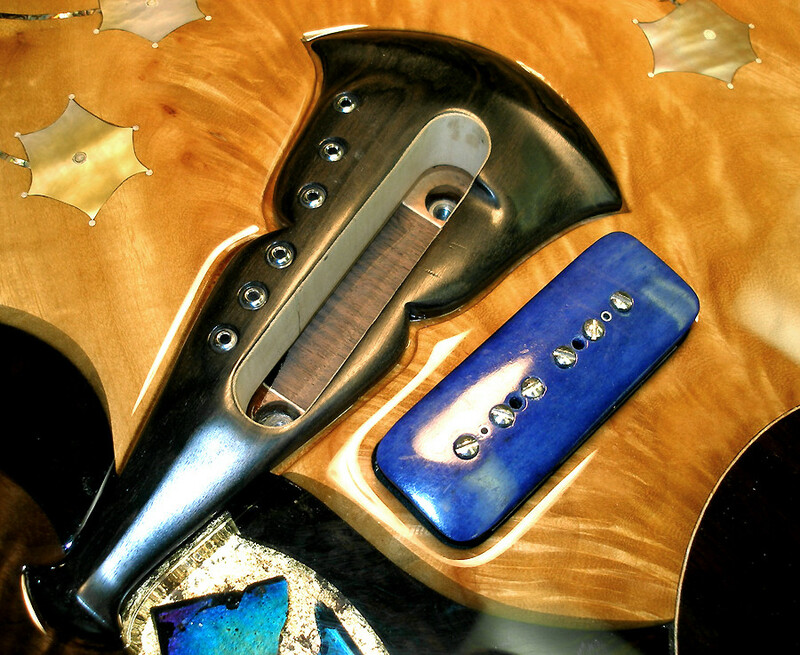 A piece of figured Mango wood covers the bulk of the body. 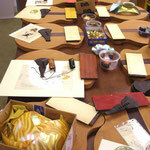 The rosette motif is fashioned from the same Rosewood as the neck and center stripe of the body. 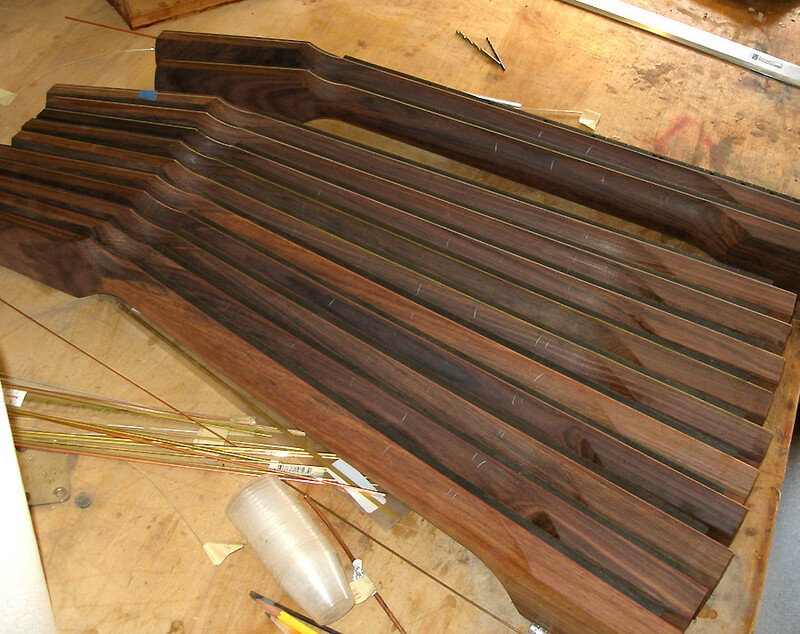 Walnut carvings frame the glass. Nouveau art was enamoured with floral decorative elements, often with a high level of abstraction. The 'Nightflower' motif fashioned from Abalone and pearl, with accents made from sterling silver, is reminiscent of such decorations. 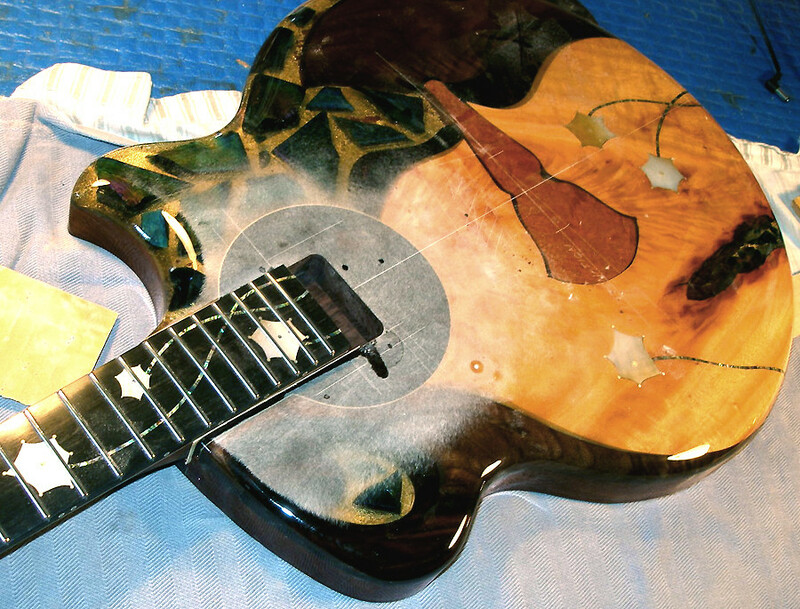 I used the decorations to break up the large surface of Mango on the body and to highlight the 5th, 12th and 15th frets in lieu of dot markers. 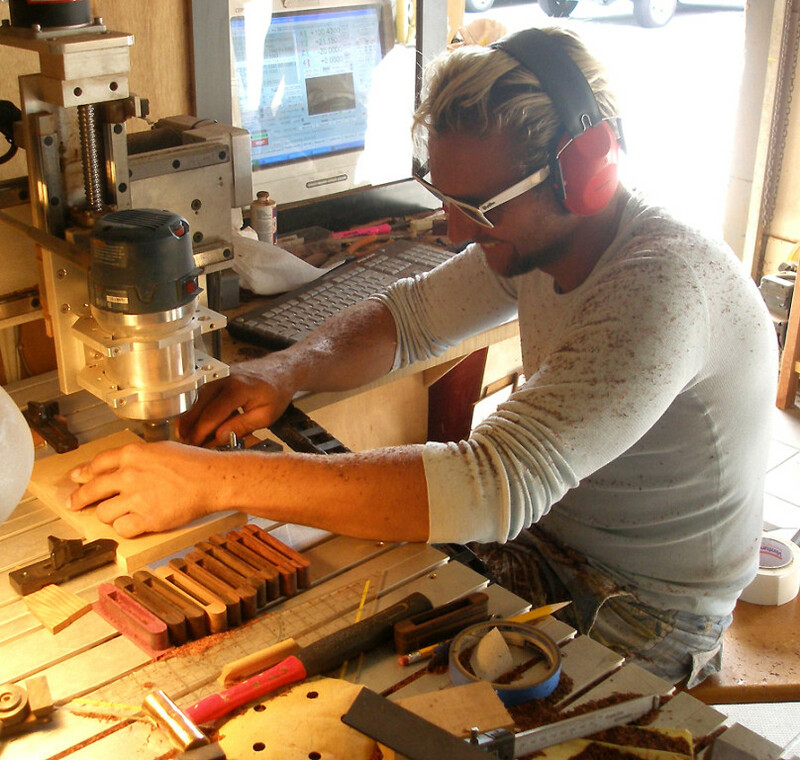 I had roughed out the necks for the 'Series' on the CNC to ensure consistent shaping. 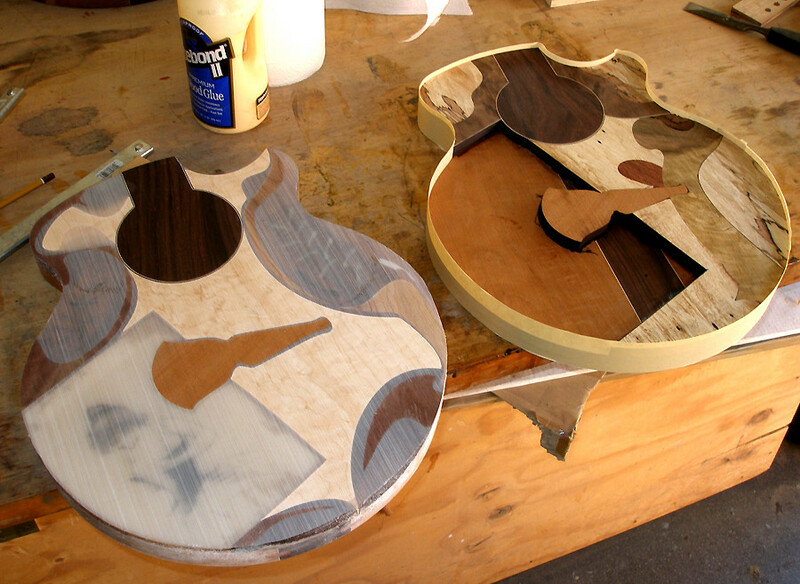 The body blanks were assembled from the same Rosewood as the necks and old-growth Mahogany. 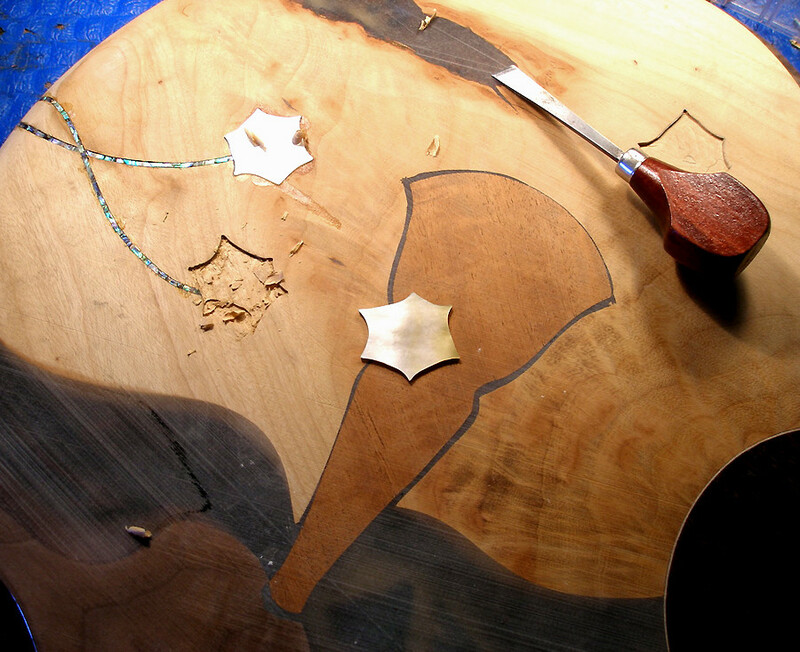 The rosette was also cut from the same Rosewood and glued onto the body blank. 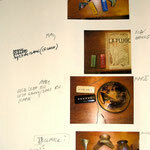 I gilded the area for the glass shards, carved the decorative pieces and fitted the various wood elements together. 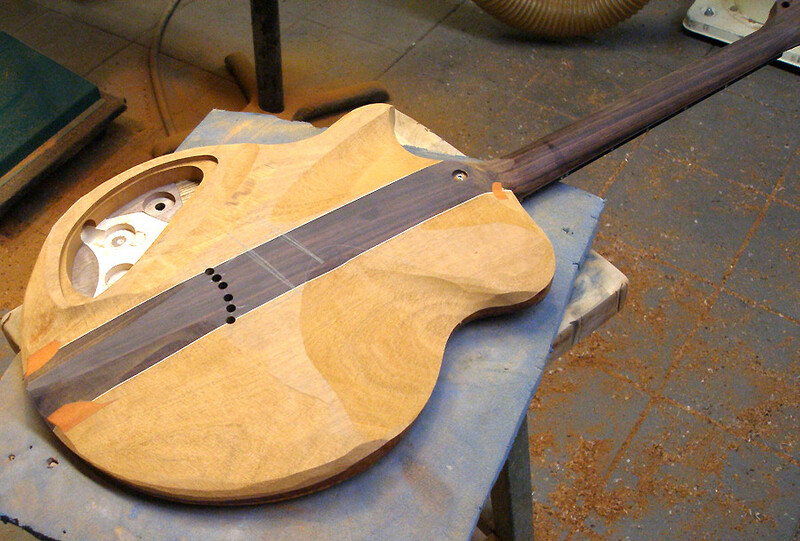 Once the body was complete it was fitted for the neck and routed for the pickups, cavity and bridge. 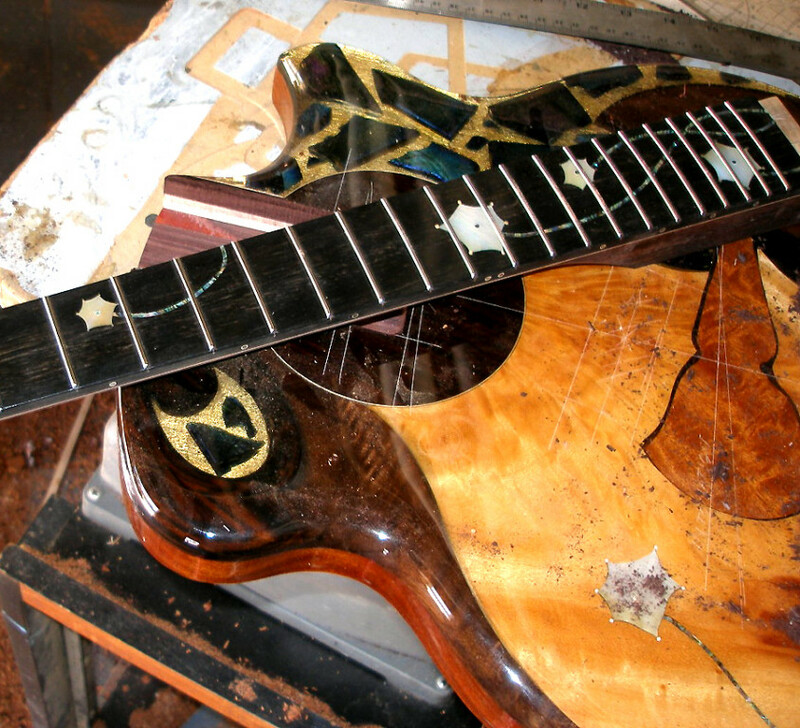 The completed body and neck were inlaid with the 'Nightflower' motif and the last coat of resin applied prior to finishing and fretting. 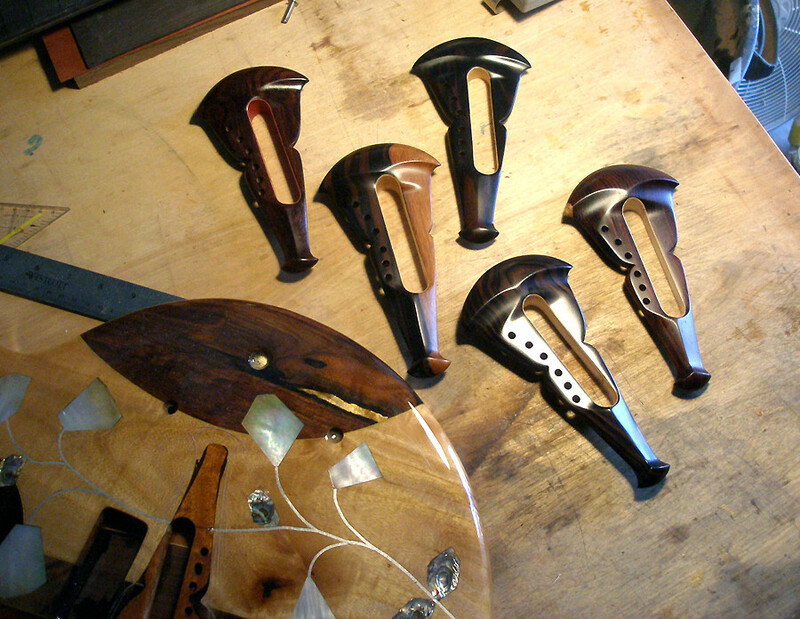 I had ordered a series of special Sperzel open-back tuners which were to be fitted with Ebony buttons for the 'Series'. 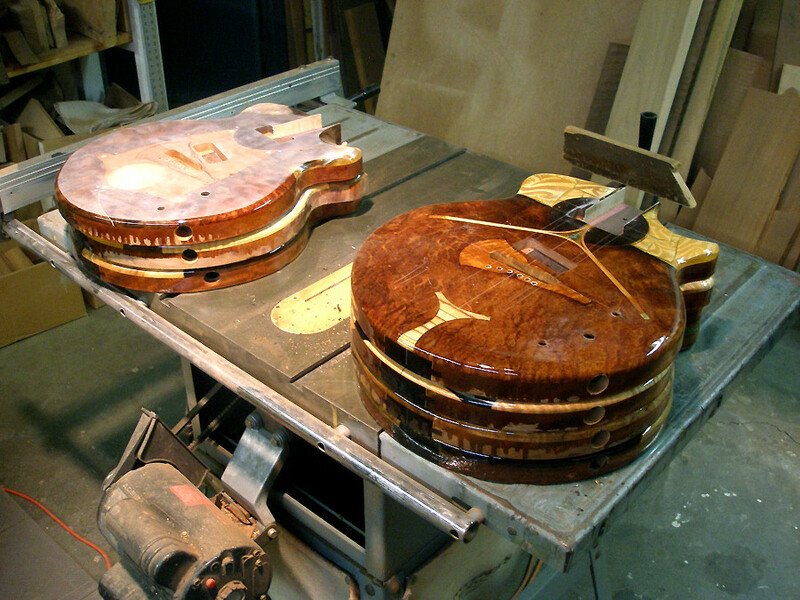 Unfortunately they were not ready as the guitar was nearing completion and so I installed a set of Waverly tuners. 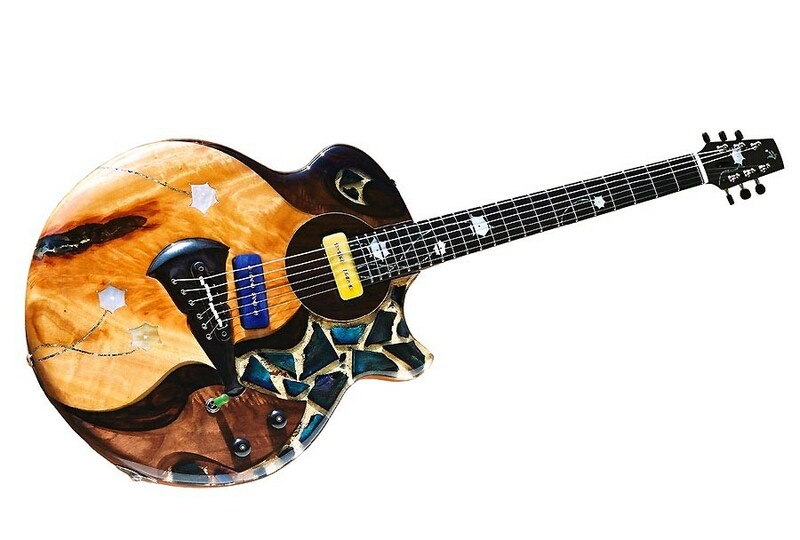 This is the only substantive difference between this guitar and the 'Series'. 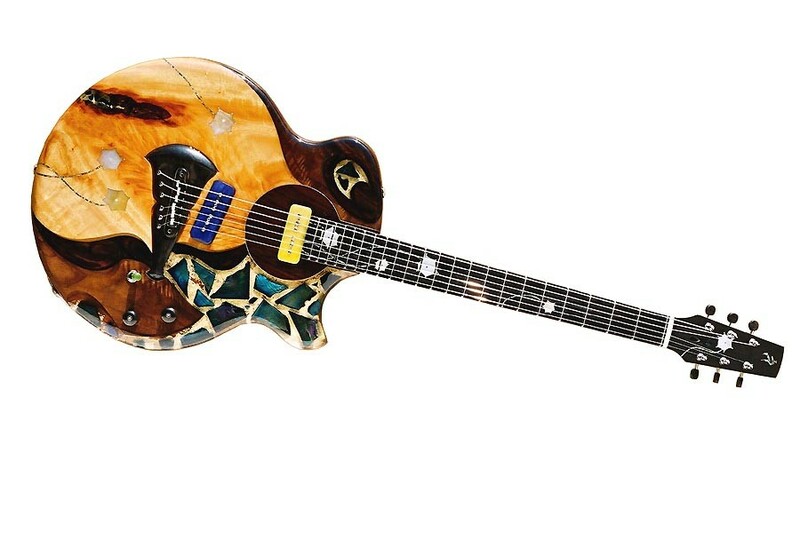 Since it was some time before I was able to resume work on the Series I decided to make this the 'Nouveau #0' - with 13 more guitars to follow. 12 of them would comprise the original Series, available for sale, the 13th guitar was to be Paul's personal 12-string model. 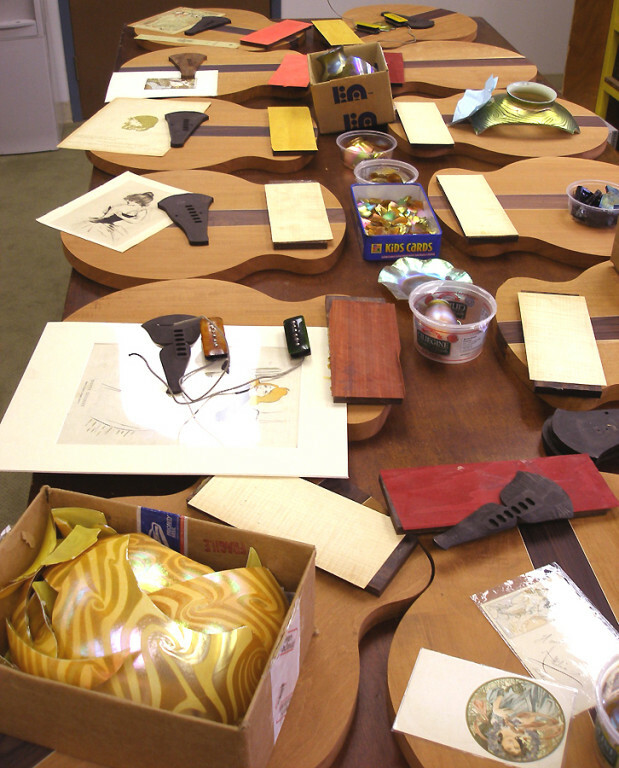 Paul and I laid out the art he had gathered and allocated the various pieces to the individual guitars. 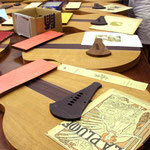 The veneer trim used on the bodies and necks was grouped in several colors and matched to the art to be included. 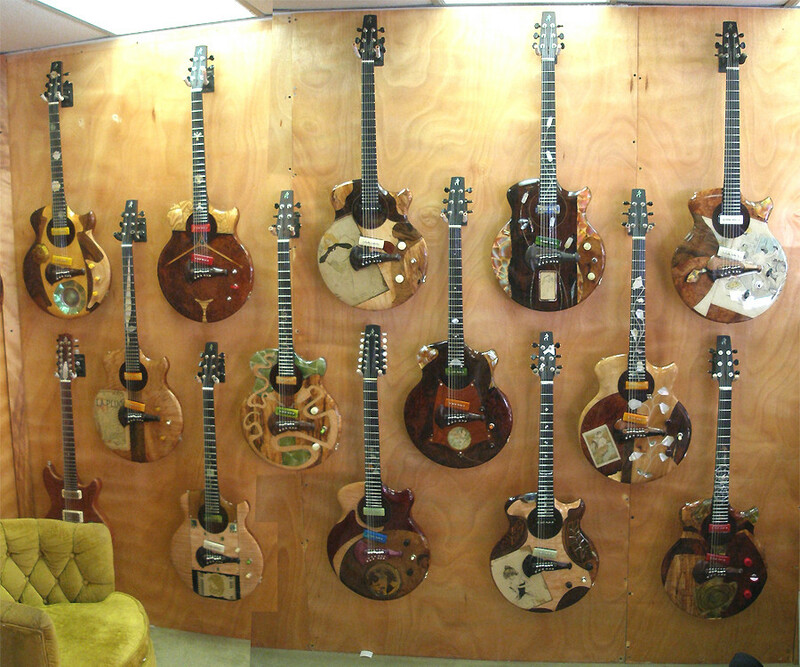 Since there were 12 guitars I correlated the color scheme roughly to the 12 months of the year as a basic organizing structure. 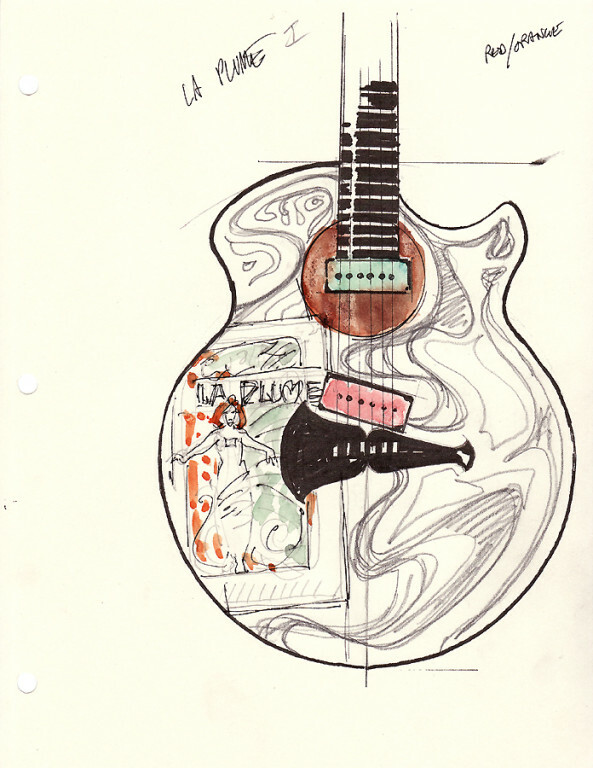 I made sketches of the design for each guitar, matching woods and art and the decorative patterns to be used for the inlays. 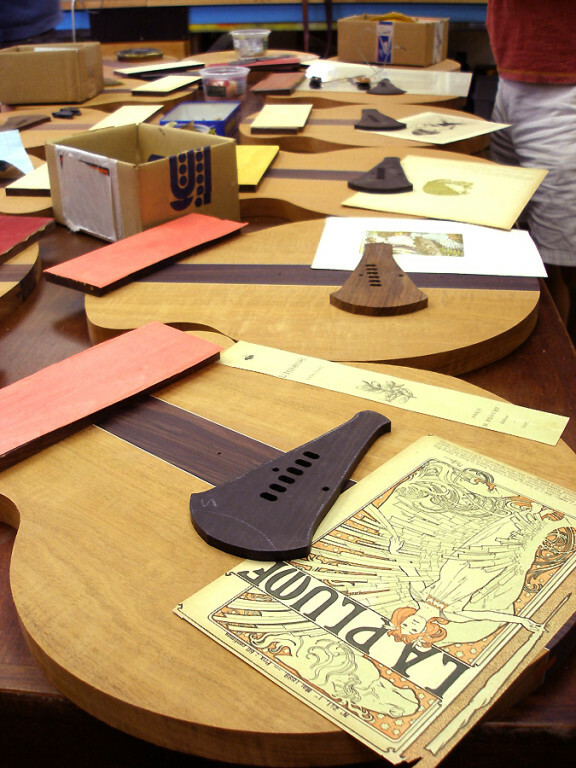 The basic structure unifying the Series was the choice of aged Indian Rosewood for the neck and centerpiece, along with body wings of figured old-growth Honduran Mahogany. 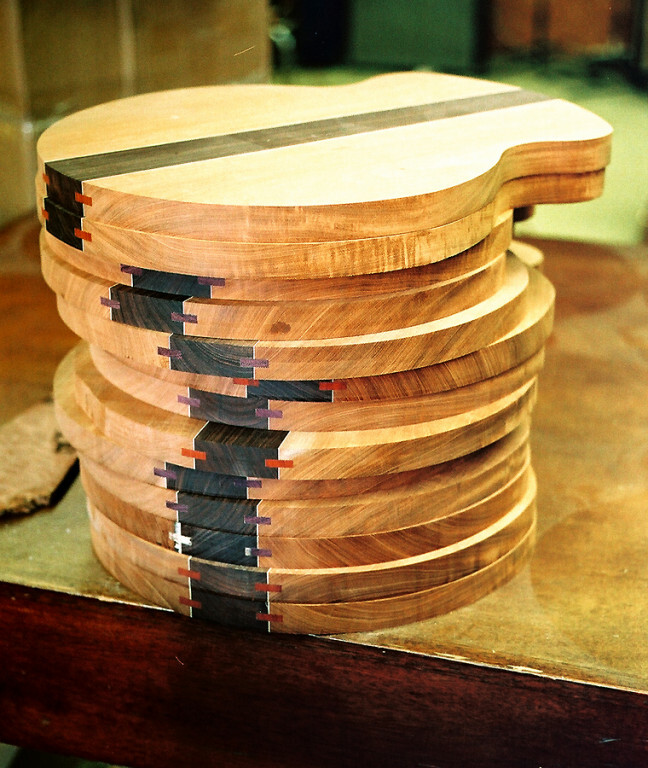 African Ebony and a slightly extended scale to give more string tension characterized the fingerboards. 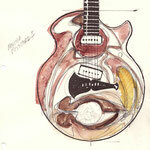 The pickups were designed around a P-90 architecture, which I consider still to be the best sounding design. 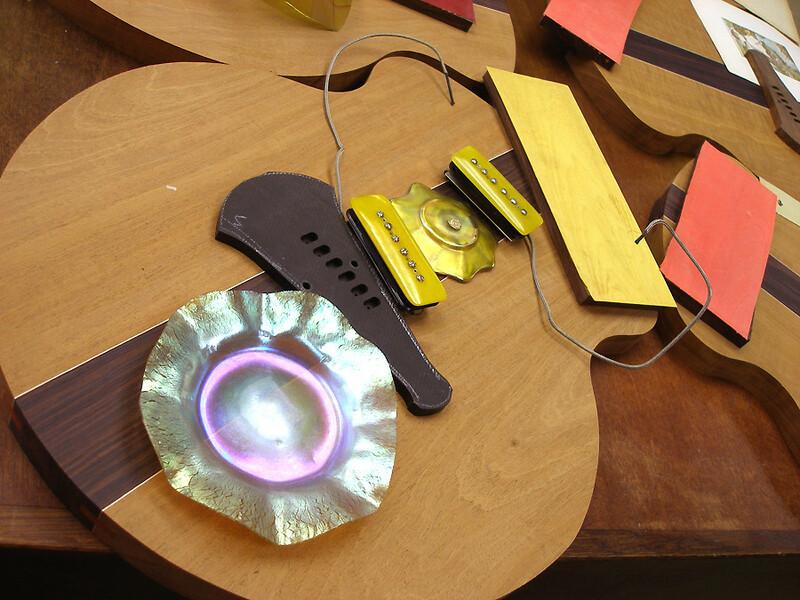 Each pickup was handmade and wound, the colours then matched to the individual guitars. 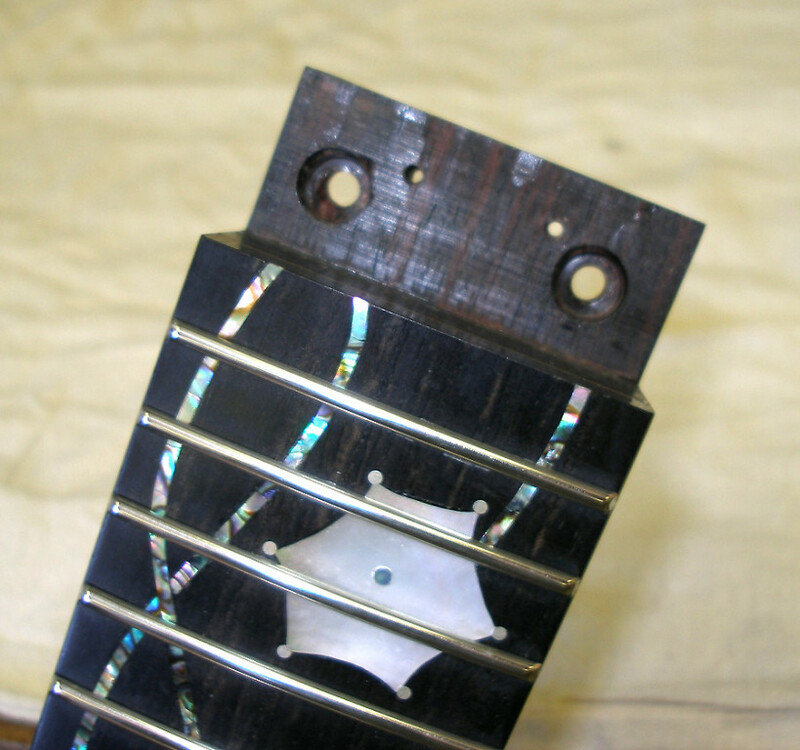 To retain clarity in the neck position we used a slightly under-wound coil with ceramic magnets, while the bridge was fitted with Alnico magnets for warmth and sparkle. 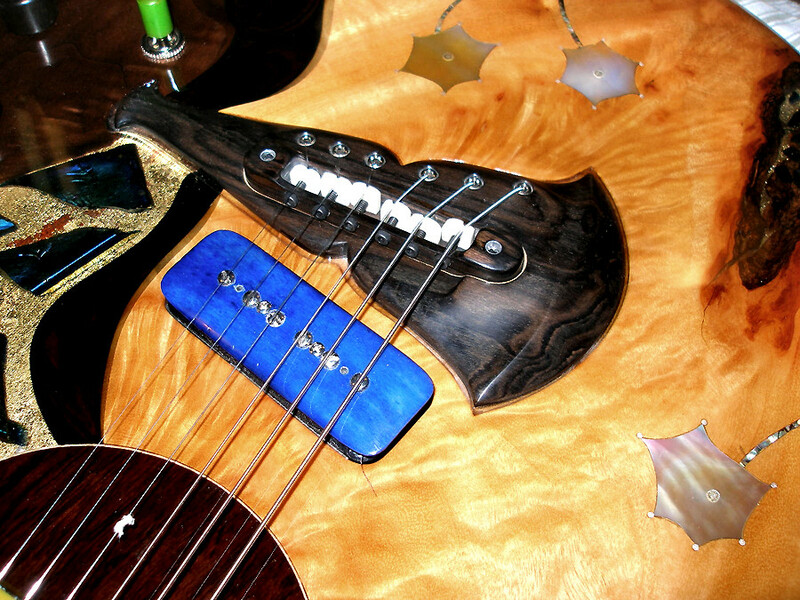 I searched for knobs to match the artwork and had custom cases made. 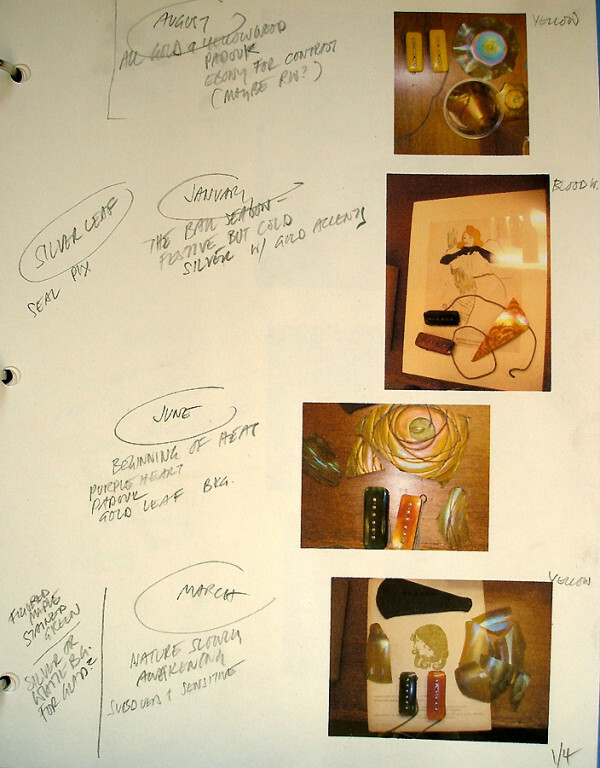 Each element had to contribute to the overall excellence of the Series. 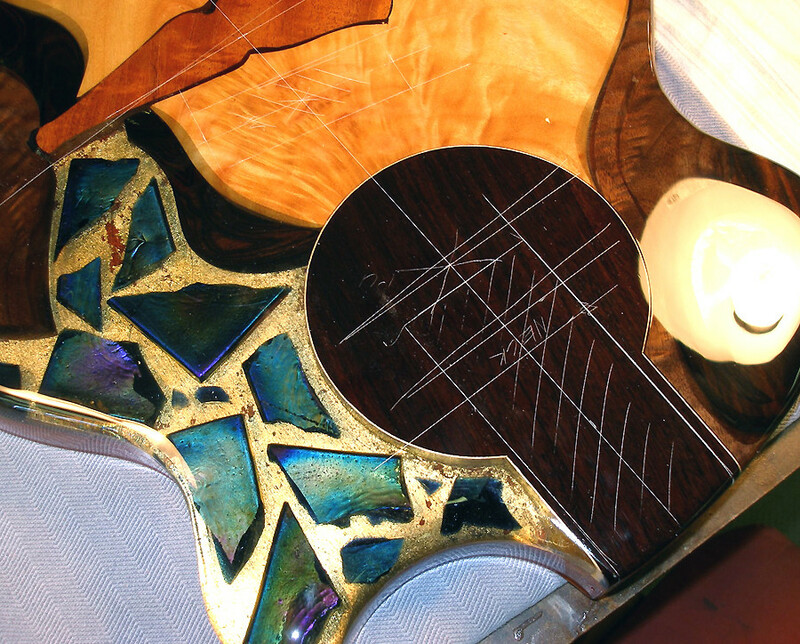 There were two aspects to the work, intricately intertwined: the design and execution of the art and the craft and construction of a musical instrument. 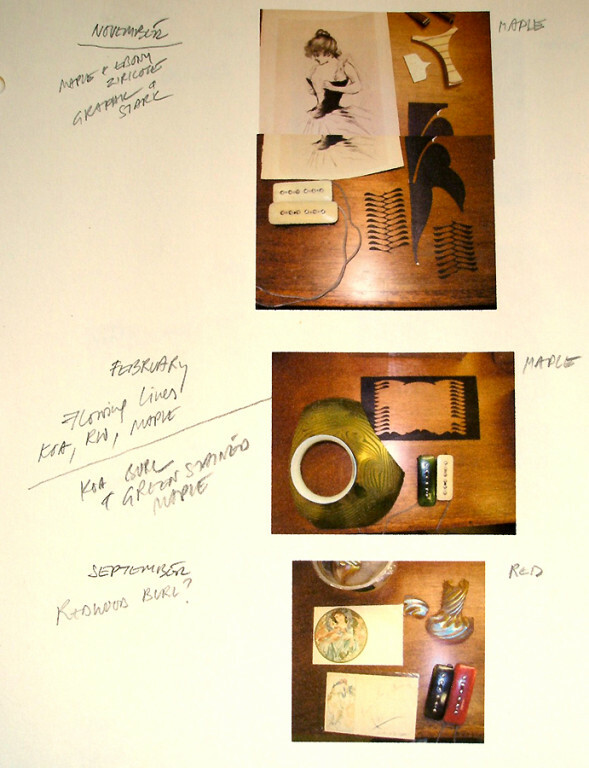 Both had to proceed hand in hand - a process which is exemplary to much of Nouveau art, where the line between art and craft is blurred and both are combined to serve the larger "Gesamtkunstwerk". 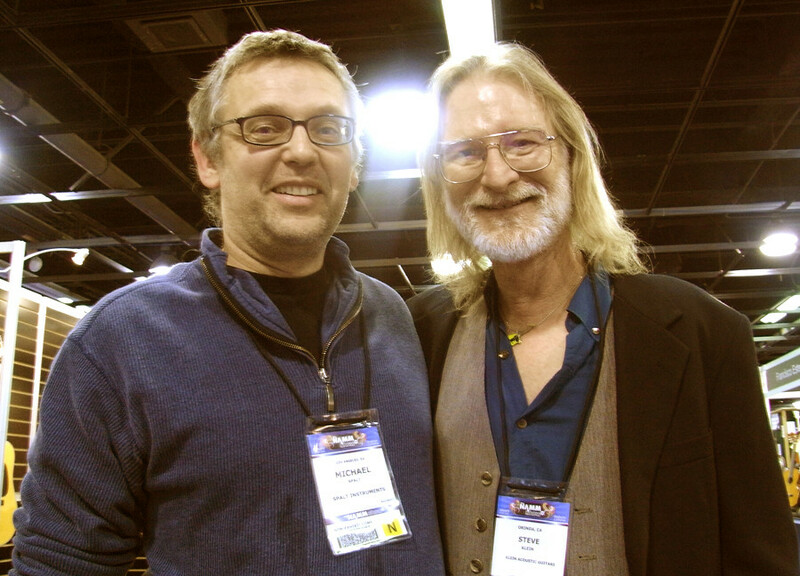 This is something I have always strived for in my work, since I view both the artistic expression as well as the quality of the craft as equally relevant and valuable. 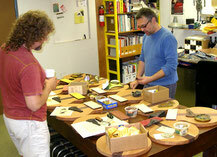 Great craft comes from an understanding of the nature of the material and the purpose it can be put to. 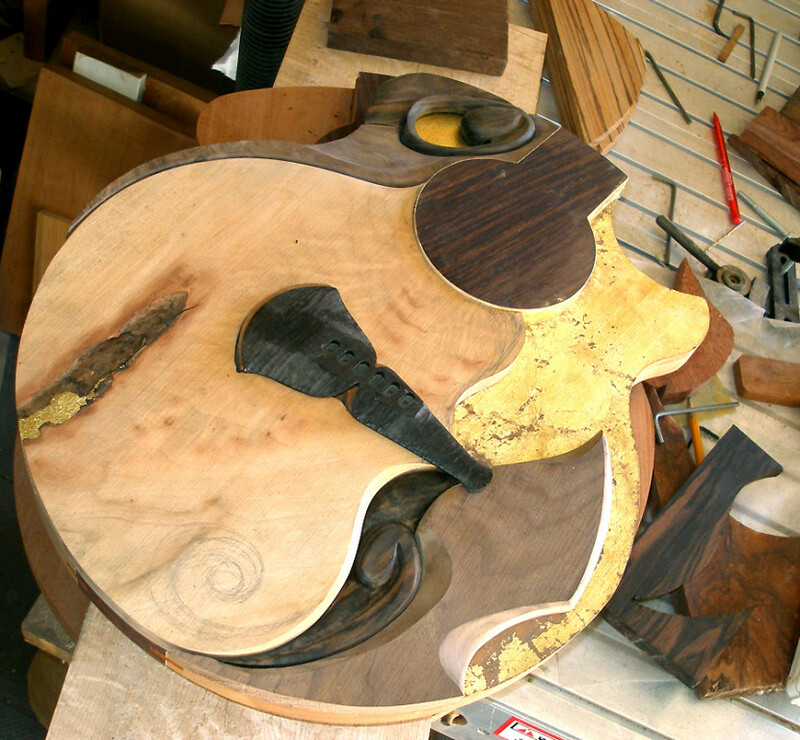 This is especially evident where musical instruments are concerned - the combination of the materials used and the construction technique employed have a great impact on the quality and expressiveness of the instrument. 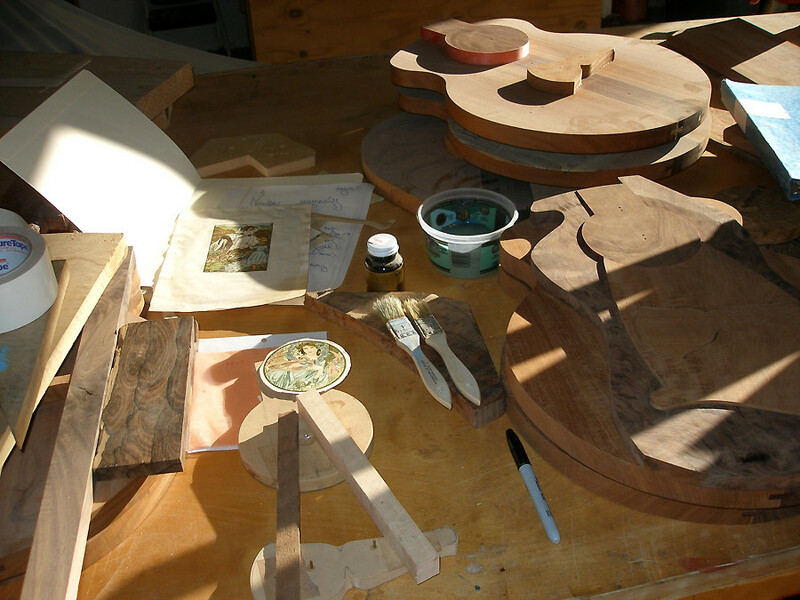 The work proceeded in stages: first the basic woodwork, the necks and body blanks. 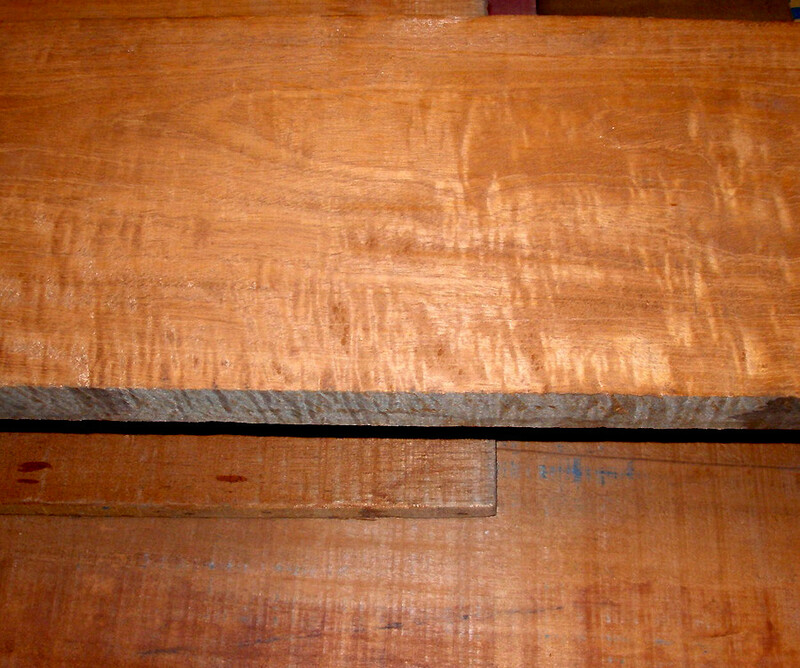 The wood had to be selected and matched. 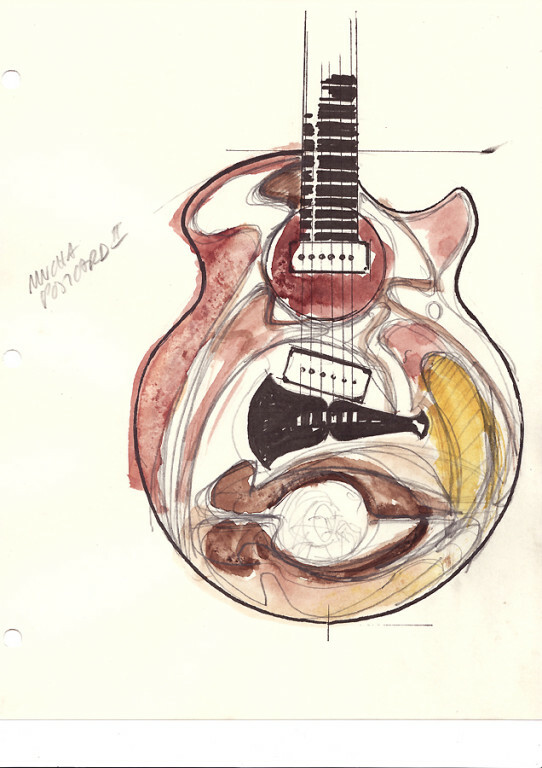 I then started with the art, working from the sketches I had made of each guitar based on some of the ideas Paul and I had discussed when we met. I proceeded with several pieces at a time, allowing the designs to mature and come together so each guitar would reflect the art included, be an individual piece, yet clearly be part of the Series. 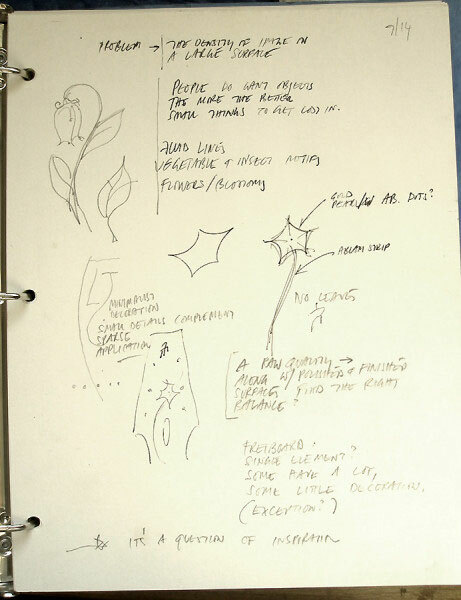 Some emerged quickly, the final design almost imposing itself, while others had to be coaxed and prodded into their final completed form. 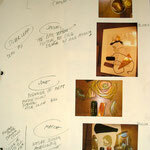 Some of the art was figurative and these elements had to be reflected in the wood choices and shapes of the design. 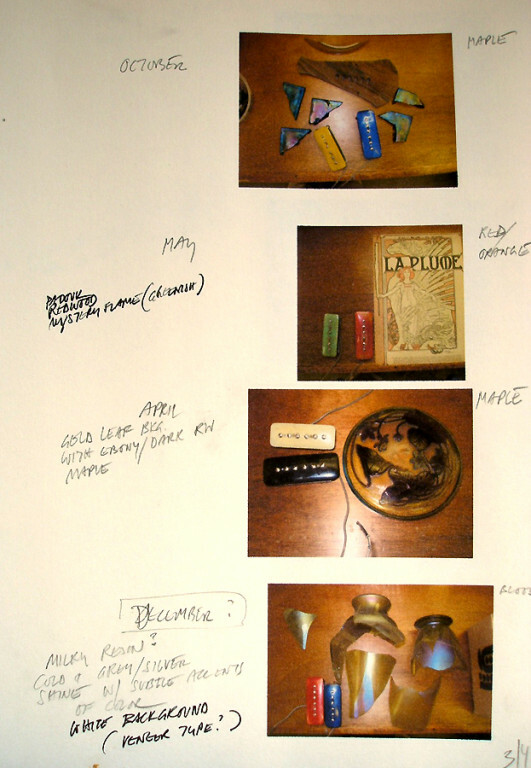 Some of the abstract glass fragments necessitated an approach based more on colour, and on the patterns in the glass. 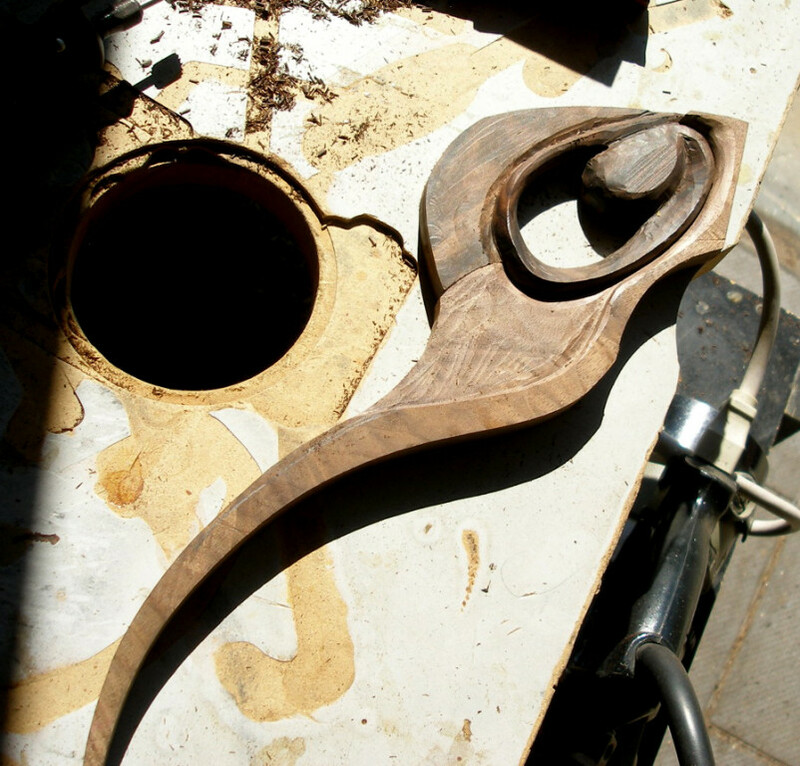 I took inspiration from Nouveau art and period furniture and objects, looking for floral elements or insect designs and ornamental flourishes. I did not want to get too literal, but use the Nouveau elements as found art, commented on and set-off by a contemporary sensibility. Much of my work is a form of decoupage and assembly, an approach which historically dates to a period after the Art Nouveau movement faded from popularity. Staying true to the spirit and colour of the art while integrating fragments and leftovers of it into a new whole was my goal. On another level this integrative approach held for the Series as such - they hold together, linked by a common vibe, even though the art included may be very different in form.